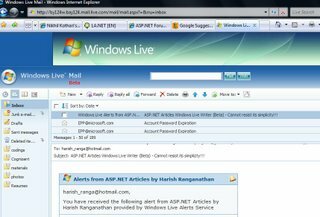 Windows Live Mail Beta is the next version of Hotmail and one of the services provided by Windows Live. What is great is that, you dont need to get a new account or get an invite from others. All you have to do is continue your existing Hotmail Account. And that is all !!! I am pretty sure many of you would have already seen this but its for the benefit of those who havent accessed their Hotmail account for long time and for new users who would like to experience the Windows Live Mail Beta. The UI is appealing and it is configurable, you can select upto 9 different themes as well as apply custom themes to the mail interface and it gives you an Outlook Experience with little response time. The UI and experience has been further improved in the subsequent releases and in the M8 Version it looks really appealing. Check out Windows Live Mail Beta and I am sure you would start loving it.